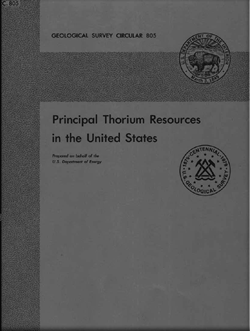 Resources were assessed for thorium in the higher grade and better known deposits in the United States in: (1) veins, (2) massive carbonatites, (3) stream placers of North and South Carolina, and (4) disseminated deposits. Thorium resources for the first three categories were divided into reserves and probable potential resources. Each of these then were separated into the following cost categories: (1) the amount of ThO2 prodicible at less than $15 per pound. (2) the amount producible at between $15 and $30 per pound, and (3) the amount producible at more than $50 per pound. The type of mining and milling needed at each deposit determines the capital, operating, and fixed costs of both mining and milling. Costs start with the clearing of land and are carried through to the final product, which for all deposits is ThO2. Capital costs of mining are affected most by the type of mining and the size of the mine. Those of milling are affected most by the kind of mill, its size, and whether or not extra circuits are needed for the separation of rare earths or some other byproduct. Veins, massive carbonatites, and stream placers of North and South Carolina have reserves of 188,000 short tons of ThO2. and probable potential resources of 505,000 tons of ThO2. Approximately half of the reserves and probable potential resources can be produced at less than $30 per pound of ThO2. Veins are the highest grade source in the United States and have total reserves of 142,000 tons of ThO2 and probable potential resources of 343,000 tons. About 90 percent of the reserves and 91 percent of the probable potential resources can be produced at less than $15 per pound of ThO2. Seven vein districts were evaluated: (1) Lemhi Pass, Mont.-Idaho, (2) Wet Mountains, Colo., (3) Powderhorn, Colo., (4) Hall Mountain, Idaho, (5) Diamond Creek, Idaho, (6) Bear Lodge Mountains, Wyo. and (7) Mountain Pass, Calif. Eighty-seven percent of the total reserves and probable potential resources are in the Lemhi Pass and Wet Mountains Districts. The first district has reserves of 68,000 tons of ThO2 and probable potential resources of 124,000 tons that can be produced at less than $15 per pound; the second district has 54,000 tons of reserves and 141,000 tons of probable potential resources producible at less than $15 per pound. Rare earths are a common byproduct, and in many veins they are from one-half to several times as abundant as thorium. View report for unabridged abstract. Staatz, M.H., Armbrustmacher, T.J., Olson, J.C., Brownfield, I.K., Brock, M.R., Lemons, J.F., Jr., Coppa, L.V., Clingan, B.V., 1979, Principal thorium resources in the United States: U.S. Geological Survey Circular 805, 42 p.